Who knew her tales were nothing but lies? M. Lynn Johnson lives in Bellingham, WA, where she spins yarn of many colors and often knits it into stories and illustrations, amusing only herself most of the time. The Art of Warble is base upon the designs and illustrative art of the 19th century. By infusing the fairy lore of Warble’s childhood into the developed technique of an adult artist, his art has become popular in the fairy art genre. In being able to keep “the child’s mind” of early youth, Warble has been able to bring this imaginative ‘interior’ perspective out onto paper as an artistically trained adult. Although Warble paints other various fantasy based paintings, it is the fairy art that truly makes magic in his painting ideology. Without hope or belief in the fairy lore of the western mythos, faith cannot be achieved to bring this ancient heritage into the modern 21st century. In this manner, Warble executes love and hope within the fantasy and fairy art in which he has become renowned for in the art world. 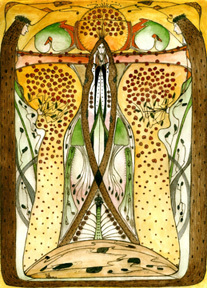 See more of Warble’s art at www.artofwarble.com.